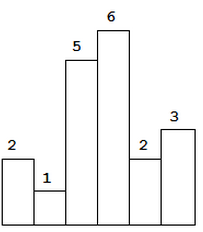 For example, given height = [2,1,5,6,2,3], return 10. If a bar is blocked by a lower bar, then the taller bar is no need to be considered any more. We only need to keep track of the bars that are not blocked. As we iterate over the bars, whenever a bar blocks a previous bar, we calculate how much area the previous bar can support. The key to solve this problem is to maintain a stack to store bars' indexes. The stack only keeps the increasing bars. This does not work for an increasingly sorted array. Say 3,4,5,6,7. I’m reasoning out this way. Does this make sense? I’ll maintain a stack of blocks that are in the increasing order. Once I see that a block comes my way that is smaller than the latest block that I have seen so far, I know that the rectangle that can be formed by the last block can’t be extended beyond that one anymore. So, I’ll go and process the contents of the stack to find out what’s the max area that can be obtained by the blocks that are a part of the stack so far. 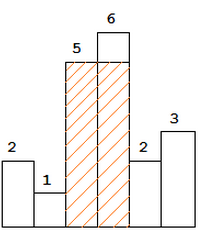 Once I’ve processed those blocks, I know what’s the max area rectangle that’s supported by those blocks. And now I’ll start working from the block that I have just seen by adding it to the stack and continue repeating the process. Once I have reached the end of the array of blocks, I know that there will be at least one block that’s not processed. So I’ll process that one as well and any others that are still in the stack. If the stack is not empty, it means that this block has started counting/mattering only recently, from some index onwards. So I’ll look at the stack’s top to get a sense of from when this block started counting/mattering for our calculations. And also note that I’ve moved one block further from this block who’s max area I want to calculate. So I need to reduce 1 from my current_location (which is i). If the stack is empty, I know that since the starting of the array the histogram has at least this height being supported. If not, I’d have had some entries in there from the past. Does this work for 2,4,5,6,7? Wouldn’t it throw IndexOutOfBoundsException when you do height in the second while loop, after you do stack.pop()? yup, you can easily prove it’s not working by using something smallish, something bigger, something smallest… 🙂 like 2, 3, 1 is the simplest case. Why “-1”? Could someone tell me? Pls use [1 ,4 ,2] to walk through.